The new Ranch Candy owners Hannah Marshall and Stephen Treviño with their dogs, Lucy and Pickles. MARFA – Around this time last year, Hannah Marshall and Stephen Treviño thought they were going to have to leave Marfa. Treviño had left his job at the Hotel Saint George and they needed to decide the next step. However, someone told the married couple that if they love Marfa, Marfa will find a way to support them. “And I think that is 100 percent what happened because we do love Marfa,” said Marshall. 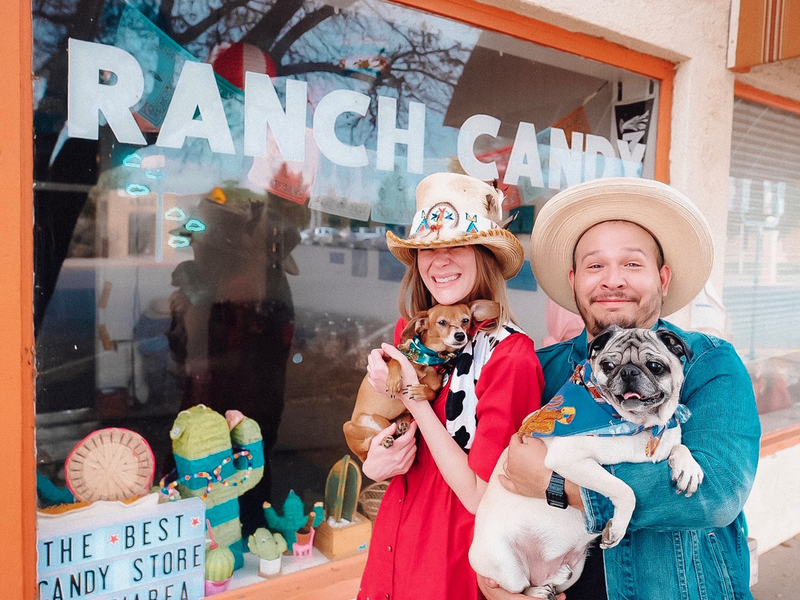 Marshall and Treviño are the new owners of Ranch Candy, the only candy store in town. They are celebrating with a Grand Stay Opening Party from 11am-8pm, Friday, April 19, at Ranch Candy. Lynda Barnes and her husband Joe Pat Clayton originally opened the store to showcase Clayton’s photography as well as have a place for the younger residents and visitors. When they moved to Marfa with their daughter, they realized there weren’t many options for children to do or to shop. Barnes said they wanted to open a store where everybody, no matter the age, could shop. Ranch Candy opened its doors in the spring of 2015, offering handcrafted goods, artwork, vintage boots, and of course, candy. Barnes said she noticed that the majority of the customers were tourists, but there were a lot of children, including locals, that came in for the sweets. “I will say I got just as much joy selling a 60-cent bag of candy to a local kid as I did selling a $600 piece of art,” said Barnes. However, Barnes works in the wine business and travels a lot. Her family moved to Marfa for its close proximity to El Paso and the airport, but the three-hour drive eventually became too much. So they moved to El Paso. It was then when they asked Marshall, who Clayton met when they worked at the Hotel Saint George, to run the shop for them. As time progressed, Marshall started taking on more roles, such as purchasing the goods for the store. Treviño eventually became more involved. “Joe Pat and Lynda were then able to step back completely while we were there essentially full-time,” said Treviño. The more the two couples worked together, the more they realized it was a great fit. Barnes and Clayton realized it took a lot of their time to run a store in Marfa from El Paso and the decision to sell came when they decided to open a store in El Paso. They felt like Marshall and Treviño were the best choice, and the change in ownership was announced in March. Ranch Candy will keep the same goods and candy with the addition of more vendors from the Tri-County area and the border region. There is a local discount and a candy fund. Barnes didn’t want a kid to feel bad that they didn’t have enough money to buy candy, so there’s a change jar to cover the balance. It’s one of Marshall’s favorite things about working at Ranch Candy. Also seeing the children leave their own change reminds her the good of humanity. “Kids paying it forward instinctively,” said Treviño. While Marshall and Treviño never thought they would end up owning a candy store, they realized it is a dream job. “And to grow it into something that is a reflection of ourselves in this community and in the city that we love living in,” the said Treviño. I took quick portraits of some badass ladies in Marfa for International Women’s Day 2017. I didn’t include everyone because I came up with the idea the night before and I was limited on time because I had to get ready to leave for SXSW the next day. All of these were taken with the iPhone 7+ portrait mode and edited with A Color Story app.